Obviously these are a collaboration between the glorious Van Winkle bourbon distillery and Drew Estate. I knew it was barrel-aged but was somewhat surprised to read that it's fire-cured, just like the KFC line that's pretty popular right now. The Process: The Kentucky leaves (not the Nic?) are smoked barn-style for about 2 weeks over hardwoods. From there, they're taken down to Louisiana and stuffed into 53-gallon barrels that may or may not be the actual Pappy barrels - there's some differing info out there. The leaves are left in the charred oak barrels for about a year, only opened 3 times to rotate. The barrels are sealed almost vacuum-style which helps to intensify the flavor-profile. From there, the entire barrel is shipped to Nicaragua for rolling. Interestingly, it was Pappy's great grand-daughter, Carrie, who approached Drew Estate about creating a custom smoke to pair with the distilleries products. This band gives the same air of exclusivity the Pappy name conveys. It's wordy and the pic of ol' Pappy himself lighting up a stick looks like it would be just as at home on a bottle of his bourbon as it does on the cigar. The Pappy is a beautifully made cigar. There are some raised veins here and there but otherwise the dual wrapper is quite smooth. The dual wrapper is interesting and unique - the two wrappers meet seamlessly and, honestly, you'd never know it's two distinct wrappers if it weren't for the color transition. 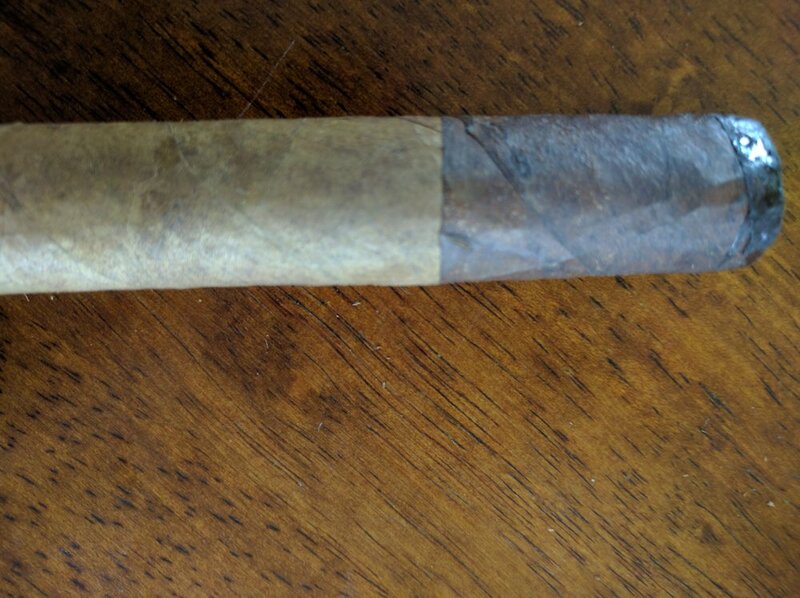 I usually leave the band on my cigars while I smoke them, but in this instance, I wiggled it off early to get a look at the wrapper. The cigar has a nice firmness to it, just a bit of give. The cap is smooth, sturdy and looks well-constructed. The foot reveals layers of lighter and darker filler. This thing smells heavenly, like what the Pappy fermenting cellars must smell like. Nothing but charred wood and strong bourbon on the nose - and it's fantastically overwhelming. Maybe a little peaty as well. Again, the cold draw is like sniffing along a charred old bourbon barrel. Some smoky sweetness as well. Admittedly, I cut a little too much off the cap on this one - my bad. I use my single-flame butane to lightly toast and light. The cigar goes up perfectly and we're under way. The draw is quite enjoyable, smooth without being too easy or loose. Right away, voluminous smoke expels for the cigar - not out-of-the-ordinary for any Drew Estate is involved with. Initial tasting notes are sweet (not overly) and quite smooth - maybe some vanilla and toasted caramel in there. 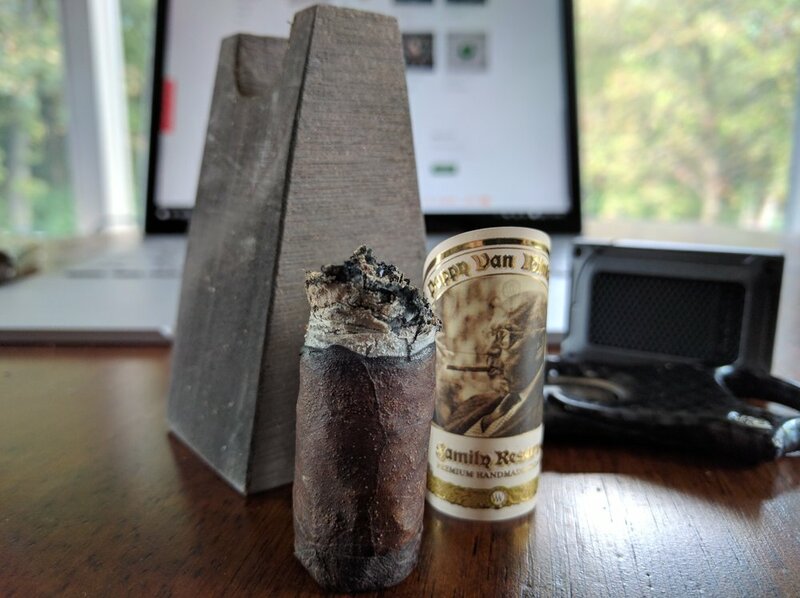 It's a Drew Estate - so smoke is everywhere and even while resting it's churning out still a decent, steady stream of smoke. 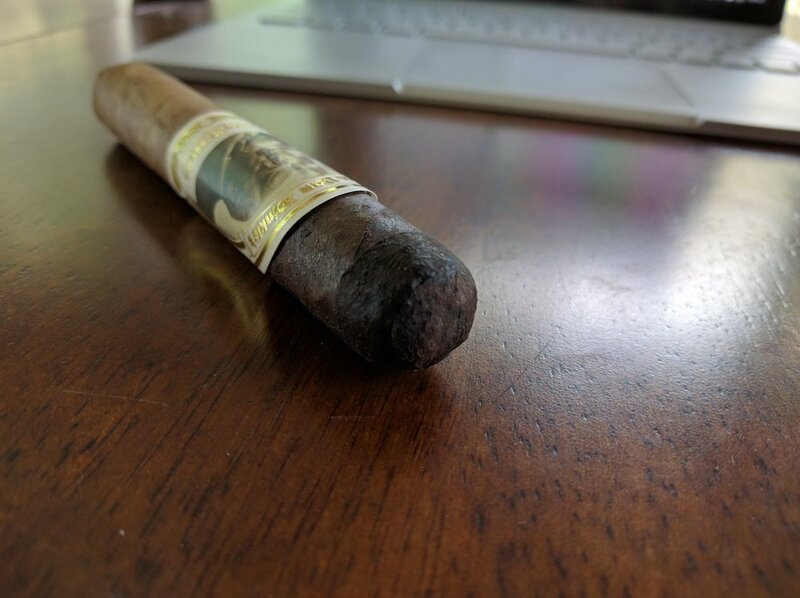 Smoke has a very pleasant aroma to it - you can tell this is not your typical cigar. The sweet vanilla and honey notes are prevalent. There's also some caramelized brown sugar that is just awesome. All I want right now is an old-fashioned to go with this thing. This one definitely does not get in earthy or spicy tones - I have a feeling it's going to remain on the sweeter side down to the nub. Although, there are still some charred wood, campfire elements but they take a bit of a back burner to the more in-your-face sweet notes. Malty, vanilla, caramel flavors continue and develop. There's a bit more tobacco flavor mixed in now too - not a lot, but it's there. The charred wood has turned into a slightly more almost bitter taste - not offensive, just different. The burn line has been a little wavy but nothing unmanageable or detracting from the experience. Going into the final third the sweet profile has gradually faded to return more to the charred wood and almost spicy tobacco notes. 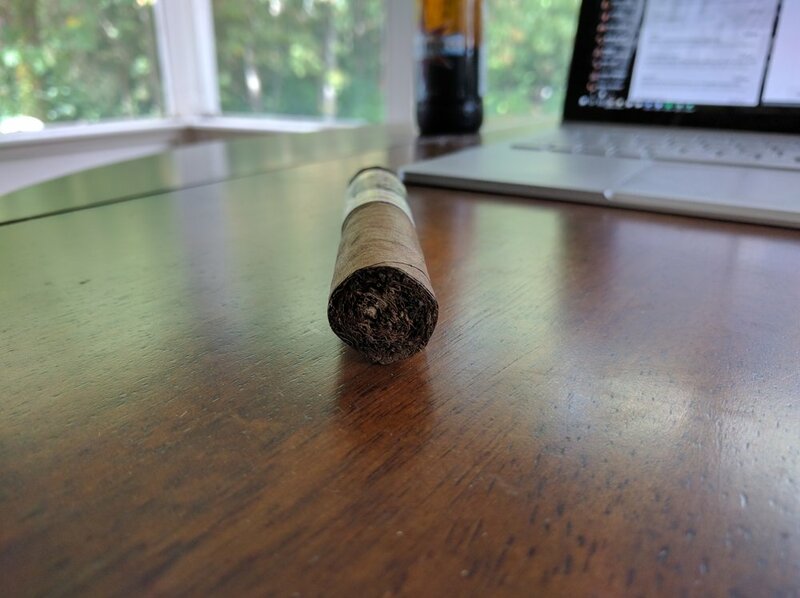 I've gotta admit - for as excellent as the front two-thirds of this cigar was; the back third is equally lackluster. Pappy started out with these amazing vanilla, brown sugary notes that seemed perfect for a bourbon-centric cigar. The charred wood was also right in line but then somewhere in the final third it fell off for me. I really enjoyed this smoke. I've been looking to get my hands on some Pappies for a little bit now and it most certainly did not disappoint! As a bourbon lover, I'll probably light up another one (probably go toro) tonight with a glass (or two) of nice bourbon - no Pappy on-hand sadly - but rye is supposed to be the perfect pairing for it. This truly is a fantastic smoke and a very pleasant blend between a traditional cigar and an infused cigar. The sweet and smoky profiles that are prolific throughout are just amazing. If you see one, smoke it!